We invite parents, guardians and well wishers to join us in saying congratulations to the SEA Class 2016. Fourteen Students sat the examination: seven students passed for Bishops High School; two students passed for Signal Hill Comprehensive School and Five Students passed for Scarborough Secondary School. Two of our students placed in the Top 20 Students for Tobago and the School placed fourth overall for Primary Schools in Tobago. Congratulations kids. Job well done and continue to reach for the stars::) Parents of Graduating Class we also thank you for your support and urge that you continue to encourage your children. 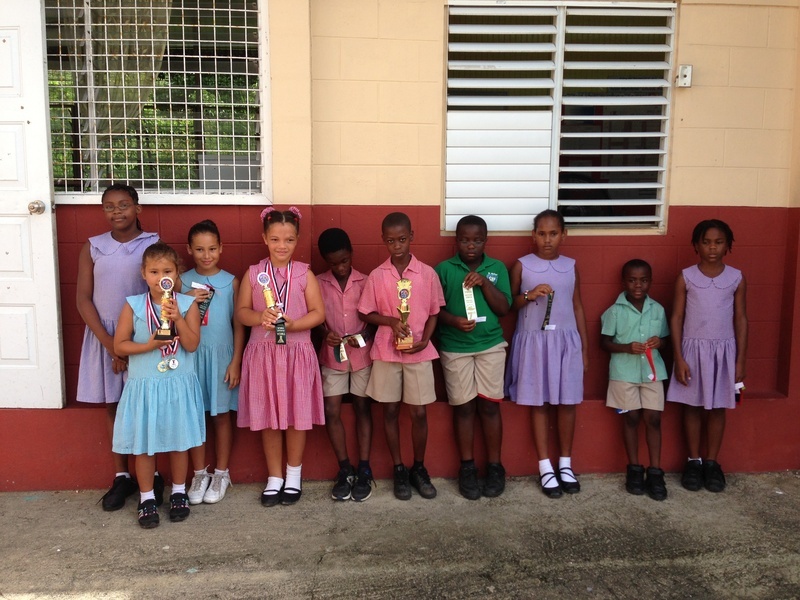 ST. NICHOLAS PRIMARY SCHOOL STUDENTS OF THE MONTH FOR OCTOBER "ORGANIZATION"
St. Nicholas Primary School Place 3rd overall on Tobago YMCA swim meet. St. Nicholas Primary School Place 3rd overall on Tobago YMCA swim meet 2013. "The Allan Forbes Trophy for Primary School Choirs Girls, Boys or Mixed went to the St Nicholas Private School Choir for its performance of the test piece “Come Golden Sunlight." "The Girls’ Vocal Duet (10-12 yrs) was won by Aliya De Freitas and Mya Alghali of St. Nicholas Private Primary School." 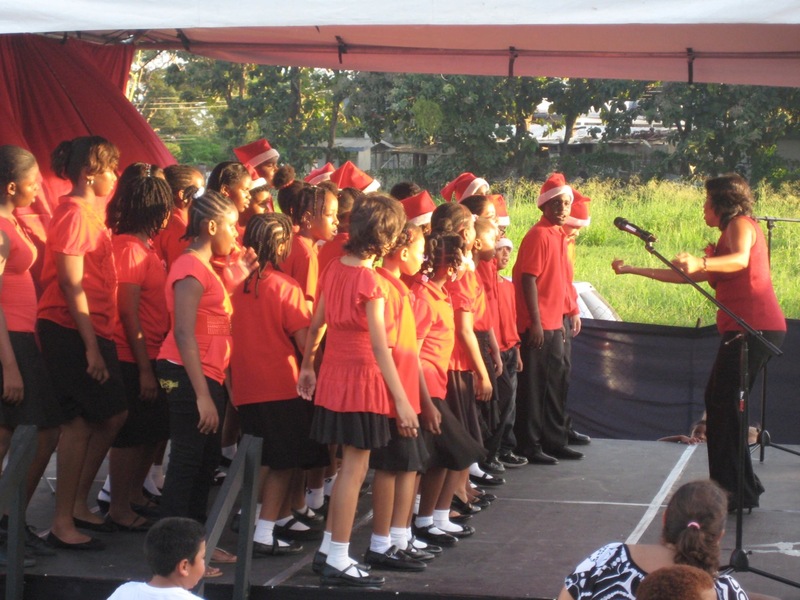 Congratulations also to Tobago's Signal Hill Government Primary School Choir who won several awards at the 2012 T&T Music Festival! Read more at http://www.trinidadexpress.com/news/Signal-Hill-shines-143434776.html and at http://www.thetobagonews.com/news/Tobago-excels--at-Music-Festival---17-trophies--and-counting-143921056.html. Our Choir at the Music Festival! St. Nicholas Primary School Folk Choir at the 2012 Music Festival! The Term One Start Date has been changed to TUESDAY, SEPTEMBER 6, 2011. This is a full day of school. Check out this article from Scholastic - 10 Non-Book Ways to Get Your Child Reading. You can start implementing these ideas over the July - August break and use them to supplement your child's partcipation in our Vacation Readers Programme. St. Nicholas students were featured in an article titled "Saving Tobago's Turtles" in the July/August 2011 edition of Caribbean Beat (the magazine of Caribbean Airlines). With our partnership with Save Our Sea Turtles Tobago, pupils are exposed to turtle awareness and education efforts as well as turtle watching opportunities during the nesting season. Come out and get your car or truck washed at our St. Nicholas Car Wash! St. Nicholas DADS and kids will be washing vehicles (exterior only - cost $40) in our school parking lot to help raise needed funds for our Sports Day prizes. Please contact David Parris at 325-5539 to sign up as a volunteer or for more information. Michael Yonic is the proud father of twelve-week old twin girls. This will be the first year he celebrates Father's Day as a dad. In the past, he made sure to spend time with his father and grandfather, showing appreciation for all they have done for him over the twenty-three years of his life. This year, Michael spent extra time with just his grandfather. He wanted to know what advice Grandpa Yonic could give him about being a dad. Grandpa Yonic smiled at his grandson when asked the question. He leaned back in his Lazy Boy recliner and said in a quiet voice, "Let me tell you the seven secrets to being a successful dad." Michael sat up straight and listened closely. Grandpa began, "Secret number one: When I was stuck and not sure what to do next, my children heard me ask for help. Don't perpetuate the myth that men won't ask for directions, go to the doctor, or ask for help. Let them see you sweat, struggle with figuring it out, and ask for a helping hand. Assume the role of learner on occasion; and allow others to take the lead, offer an idea, or lend a helping hand." He paused briefly making sure Michael was paying attention. "Secret number two: When faced with a crisis, my behavior showed that I was more interested in a search for solutions than in handing out blame and punishment." He cleared his throat. "Let go of being invested in finding fault, pointing fingers and doling out punishments. Be a problem solver, not a problem keeper. Work at finding a solution to the problem at hand rather than finding a person to blame for the problem. Consider your role in the solution as well as the role of other family members." Michael didn't say a word. He was taking mental notes. Grandpa Yonic continued, "Secret number three: When I was feeling hurt or angry, I communicated that with an 'I' statement and refrained from sulking, pouting, and yelling. Manage your feelings and demonstrate to your children that you're in charge of the choice to feel the way you're feeling. Teach through your behavior that no one makes you angry, sad or anything else." Grandpa shifted in his recliner and leaned forward slightly. "Secret number four: I regularly showed affection to my wife in my children's presence.” He smiled. "Hug, kiss, hold hands, and snuggle in front of your kids. Show them how to demonstrate love in a variety of ways. Seeing their father acting affectionate will help them be affectionate. Take it even further and give your children regular hugs, smiles, and eye contact." He gave Michael a wink and continued, "Secret number five: I showed by my behavior that being with the family is more important than doing for the family. Regularly engage in activities with your children that they enjoy: play in the sand, build with Legos, read a book together, kick the soccer ball around, make a sparkle necklace, paint a shirt, watch a kid's show, play board games or cards. The point is, Michael, be present with your kids in a way that they want you to be." Michael nodded as his eyes shifted to the right, building an image in his mind of exactly what Grandpa meant. Obviously he had experienced this in his own life with his own father. Sensing what was happening for his grandson; Grandpa paused and waited for Michael's gaze to return. When it did, he continued. "Secret number six: I modeled for my children how to grieve a loss by showing sadness and tears appropriately. Dispel the myths that 'big boys don't cry,' and 'men should be rough and tough.' A picture of a soft, gentle man is just as important, if not more so, than that of a strong, powerful one." Grandpa Yonic shifted again in his recliner. "I have only one more secret to share. Are you ready?" Grandpa continued, "This is perhaps the most important one. Secret number seven: I attempted to manage the family democratically by regularly asking for input from all family members. Offer your kids choices and allow them to pick. Ask for their opinion and encourage their suggestions. Designate a family meeting time where plans for the week are discussed, vacation ideas are shared, and chores are evenly dispersed. Spend more time listening and less time talking. Give directions less and encourage feedback more. When you do that, feelings of belonging will grow." Grandpa Yonic rested his head on the recliner and tipped the chair back slightly. Michael sat quietly processing all that his Grandpa had just told him. Grandpa Yonic said nothing more. He softly tapped his grandson’s hand and closed his eyes. Michael sat next to the recliner for several minutes listening to his grandfather breathe. He slowly stood up and whispered, "Thank you, Grandpa. That's exactly what I needed." As Michael turned and slowly exited the room, a slight smile appeared on Grandpa Yonic's face. "My pleasure," he whispered under his breath, "my pleasure." St. Nicholas Primary School celebrated World Environment Day on Sunday, June 5, 2011 with its first annual St. Nicholas Environment Day. Pupils and parents from St. Nicholas and STEP-UP International Academy as well as volunteers from WASA braved considerable rain to plant Poui trees on school grounds, participate in an abridged walkathon (due to the rain), and hear the results of the school's environmental audit.